Our parkrun event (every Saturday at 9am throughout the year) regularly attracts up to 200 runners of all abilities. The park boasts a family friendly area with an adventure playground, supersized climbing boulder, basketball hoop and outdoor exercise gym. Only good friends meet @ The Good Friends Café, where there is a wonderful selection of teas, coffee, ices and sweet and savoury snacks on offer. Table Tennis bats can be hired from the Cafe for use on the tables in the playground. If you’re looking for a way to get more involved in the park, why not take part in some of the regular events and activities that take place throughout the year, like our annual Kids' Fun Fair Day, volunteer gardening club, monthly bird watching walks, and litter picks? Take a look at our gallery to see how much there is to enjoy when you visit the park…you won’t be disappointed! 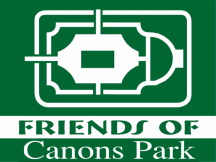 Canons Park has an active Friends group, which organises all its events and works closely with Harrow Council to maintain all its facilities – and plan for its future. Why not join us? See the Calendar page for the date of the next Steering Committee meeting - everyone is welcome to attend, contribute their ideas and offer their services. You can contact us for further information about the Friends, facilities or events in the park HERE. If you wish to report ASB (Anti Social Behaviour) please use this link. Remember if you don't report it, the police can't deal with it! ​To contact Harrow Council regarding the park, or to report fly tipping or graffiti, please call or visit their website. In case of an emergency in the park, please dial 999. For non-emergency calls to the police, such as for non-threatening anti-social behaviour, please dial 101.